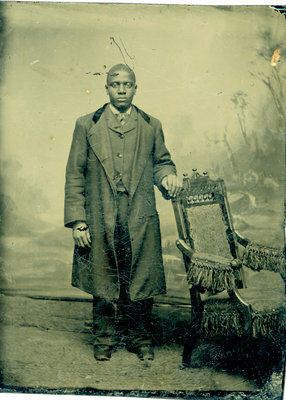 An unidentified African American gentleman in topcoat stands with his hand on the back of a fringed upholstered chair against a painted studio scene in this small black and white tintype. The name of the photographer and the location of the studio are unknown. This tintype was in the possession of Iris Sloman Bell, of St. Catharines, Ontatio. The Sloman Bell families are related to former Black slaves from the United States who settled in Canada.